We had high hopes that we’d be able to find the death record for Arnold Murray. Not sure he died in Kansas, but it seems likely, even though he is buried in Rushville, Indiana. And we hoped to get a peek at Dad’s birth certificate. Sad to say, Kansas didn’t record much of anything before 1911, so that’s out on the death certificate. And the folks in the county records office at Olathe, informed us our best bet would be to check with the hospital where he was born. Fun getting that. Dad was born in his home on the farm, on the kitchen table. Those records, apparently, have all been sent to Topeka. Another miss. We did, however, visit the cemetery and found the grave markers for Arnold’s second wife, Emma McCrum Murray (some mystery there as to why she is buried with the Betts family), and our Aunt Ora (Dad’s aunt) and her family, plus we found a very old grave marker of Mattie Ferree Murray’s aunt, Rebecca Ferree Morris – probably not so important in terms of our genealogy, but fun to see the older gravestones nonetheless. The evening was a much more successful part of our day. We met up with our second cousins, George and Asher Langworthy. Their grandmother is Ora, Roy’s sister. 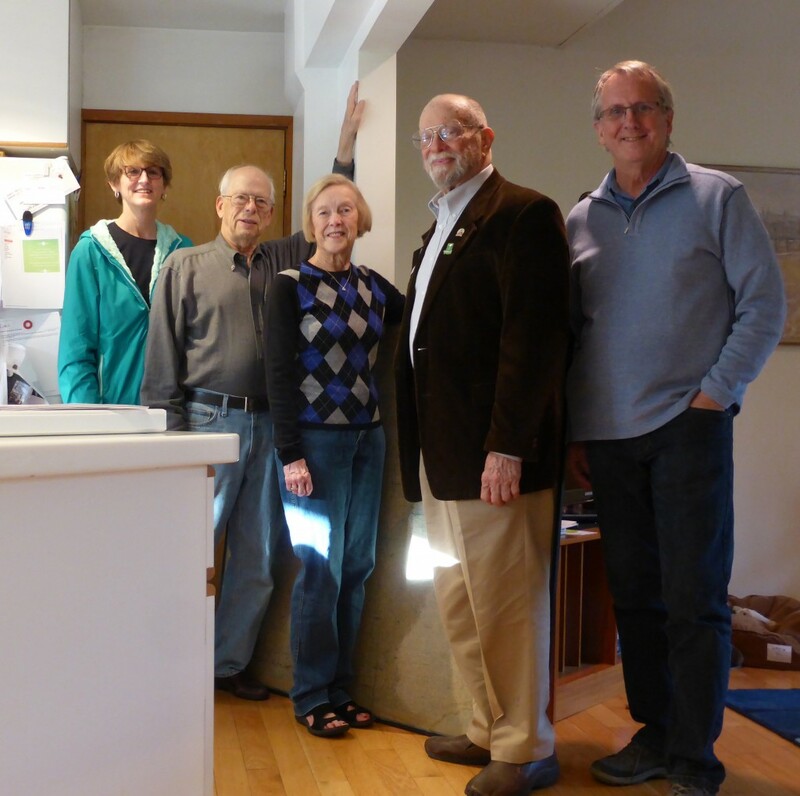 (In photo: Carol, Asher, Asher’s wife, Audry, George and Don). 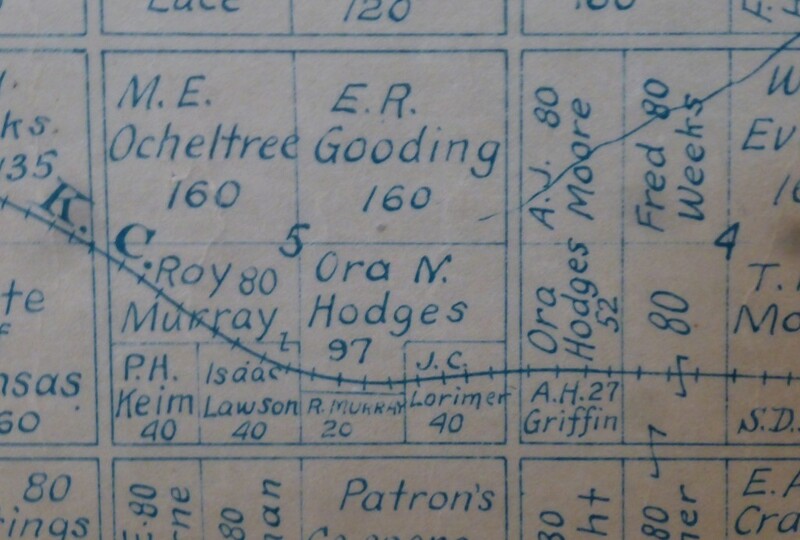 Asher had a very interesting map from 1915 showing the Arnold Murray farm divided up into Roy Murray and Ora (Murray) Hodges sections. Roy most likely sold his portion of the farm when he left for California in 1922. George shared his memories of Ora, giving us a better feel for Dad, his father and their father, Arnold. George said that he even had seen a letter Arnold had written – saving the stamp from that letter as a child. He said he’d try taking a look in the attic where that letter would be stored to see if he could find it. A very long shot, but it would be a gem of a find. George treated us to a delightful dinner at his favorite family-owned Swiss restaurant. Delicious – and walking past the chocolate counter, oh the aroma. We stayed a comfortable night in our RV at George’s place and headed out early in the morning – beginning our long journey west toward home. A big thank you to George Langworthy for so graciously hosting us!